A Gothic or pointed arch having a rise of greater than the span. A narrow pointed arch. 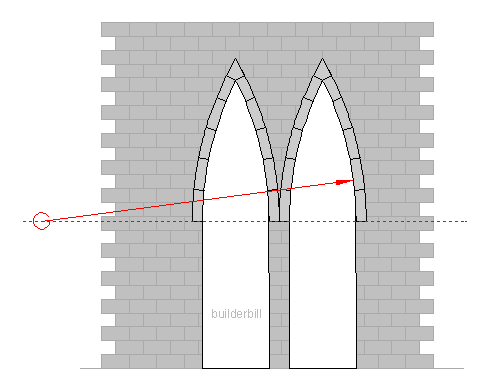 The two arches above are extreme, but they do show the centre of the arc is well outside of the arch, making the height quite a lot higher than the span. 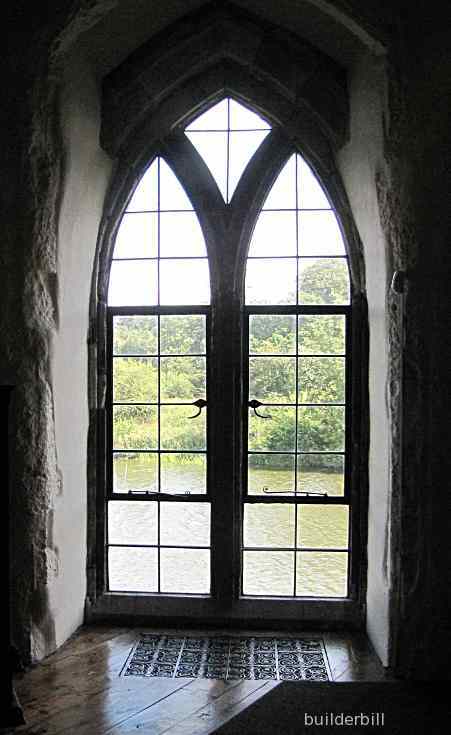 By far the greatest use of the lancet form is the division of equilateral arched openings to form windows. The photo here is with the arch divided into two main sections, but the number of lancets usually increases as the window gets wider. Once again the old master builders came up with a solution to a problem in a beautiful and decorative way. The window above at Leeds Castle in Kent is maybe six hundred years old. The art of glass-making was alive and well in those days but it was still a small cottage industry and the sizes of the panes or sheets of glass produced was quite small. So of necessity came about the the division of window openings into smaller sections. Note that this particular widow uses fairly modern glass in a 19Th. century wrought iron frame.